Around four years after I first took the stage as PWL I finally got around to releasing my long awaited debut album. 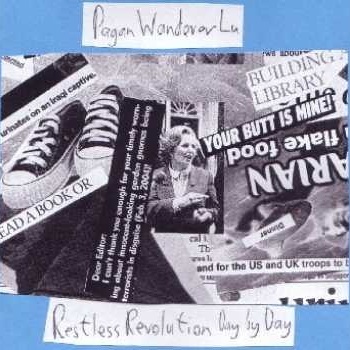 ‘Restless Revolution Day By Day’ was released in 2004, around two months before last month’s EP ‘Jazzy Jungle Memorial Hall’. It took around a year to do, started in Aberystwyth before I left university, a few songs done in Bolton, a few in Brighton, then finished off in Cardiff. It’s one of the last wilfully rough and ready PWL releases. Songs banged out with little re-take or polishing, after this I started gradually to take a little more care with things. Here you will find things which are shockingly out of time/tune and boomy production. I like to think that under all that there’s still a set of decent pop tunes. Still not quite integrating the electronic/acoustic/rock styles, the tracklist was royally screwed up by an attempt to shoehorn in the newly written ‘Hypersanity’ at the last minute, resulting in a damn weird opening portion. I was tempted to re-do it in a different order for this reissue but decided against. Artwork wise every copy had a unique cover, all made from different bits of a collage I made and photocopied, and stuck onto different coloured bits of card, with different coloured plastic disc trays. Quite an eyesore all told. It was in a jewel case with cut out handwritten tracklisting, and some sort of long waffly essay glued into the ‘booklet’. The line ‘Restless Revolution Day By Day’ is from Paradise Lost, and refers to the movements of the planets. I’ve quite a soft spot for this song, though it’s a rubbish opener. It was one of my first successfully ‘rock’ recordings and I listened to it on repeat quite a lot. My recollection of the lyrics is hazy, but I think it just touched on a lot of stuff that was happening as I left university. I’m pretty sure this is the last song I wrote in Aberystwyth (the first time). When I said above that some of this album was out of time this is the song I was thinking of. My approach to recording drums at the time was to do the guitar first and then play along underneath using a midi keyboard to trigger the sounds using two fingers. I never really did more than one take so it didn’t really work out most of the time. This song was already about three years old when I finally recorded it so lyrically it’s the earliest thing that’s been released. I think the line ‘I read it somewhere once that they put baby’s tears in bombs’ is an early manifestation of the multi-lateral cynicism which I think has often been my lyrical angle ever since. At one stage I planned to do an MA thesis on my notion of ‘Hypersanity’ – by which I meant people who are so rational that it almost becomes a form of mental illness. I.e. people like me. It was much easier to just write this bangin’ techno number about it. Previously cryptically entitled ‘B.O.A.T.S.’, this was the second appearance for this song following its first outing in 2002. Did a crudely ‘Idioteque’ style beat and replaced harmonica with synths. Lyrically it concerns complacency and watching TV too much. A kind of ‘grasp life with both hands’ message filtered through the usual negativity. The first instalment in the ‘Molly & Victor’ song series – was followed by ‘My Victor’ and ‘At the hairdressers…’. Again I’d like to just leave it to you to enjoy the story. This also appeared in acoustic form on ‘Goobye Workshy’ and is tacked on the end. This version is more upbeat and girl groupy. One of my first bona fide hits, and the earliest song to re-emerge on a record since signing to Brainlove. This version has slightly different lyrics and is a bit more raucous in its production. It was written after seeing a Brighton bus called Winston Churchill. This was written and released as a single in a limited edition of one as a Valentine’s Day gift for Siân, the girl I later married. Mostly consists of in-jokes. Only proper love song I’ve ever done really…. Yes the opening is a Bright Eyes reference, well done. One of a couple of early songs to feature me doing an impression of Roddy Woomble doing an impression of an American. Took roughly 20 minutes to record as I recall. Quick little punk number. Played it as a techno-fied version for a while back in ’05 – sadly uncaptured. Sort of Jesus and Mary Chain-y, girl group-y thing. Not the best song on here, suffice to say…. An early acoustic ‘hit’ re-done after first appearing in 2001. I’ll save discussion of it for the earlier version, which I actually prefer. Inspired by some utterly insensitive newspaper coverage of a friend’s sister’s sudden death. I still play this quite regularly. Originally entitled ‘Take Only Photographs, Leave Only Weblogs (The Spire Collapses)’. Wish I’d gone with that. Just a straight acoustic number. Another Brighton song, follows an early trend of setting traumatic thoughts to inane music. The album originally came with an unlisted Track 14, which I have chosen to omit in this reissue. Instead…. Also included are two songs from ‘Goodbye Workshy’ – this was a four track EP I released the year before. The first two tracks were ‘B.O.A.T.S.’ and ‘Vote With Yr Feet’ which were included on RRDBD anyway so I didn’t want to give it its own special reissue. I’ve tacked the others on the end here as ‘bonus tracks’. They are an acoustic version of ‘Molly’s Lips’, and an electronic version of ‘Jaded Wannabe Parade’ which I’ll talk about when we get to ‘Tank vs. Cat’ in a few months time. It came in a plain black slipcase with a marker pen drawing on the front and a bit of purple card inside with a hand-drawn tracklisting. And that’s it! For the first time this is available beyond its initial circulation of about 20 people. As usual it’s ‘pay what you like’. As usual the money is going into a new record – which I’ll be playing songs from for the first time at some gigs in May. Stay tuned. 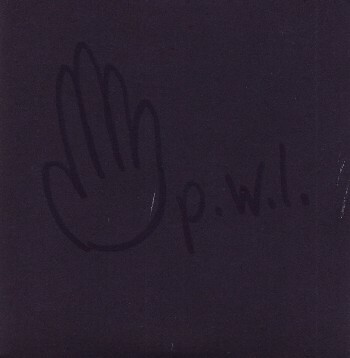 This entry was posted on April 19, 2011 at 11:00 and is filed under PWL News, Releases. You can follow any responses to this entry through the RSS 2.0 feed. You can leave a response, or trackback from your own site.